Free shipping. Buy direct from HP. 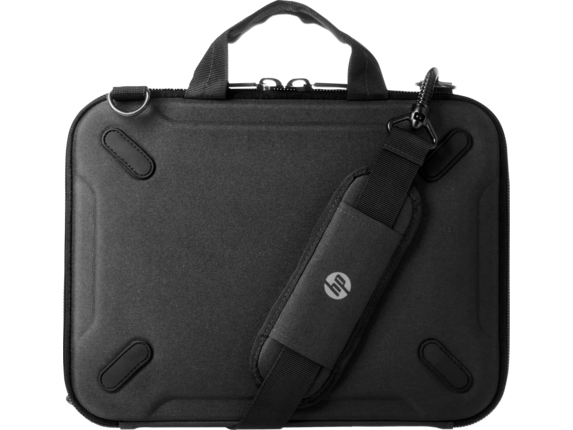 See customer reviews and comparisons for the HP Chromebook 14 Black Always-On Case. Upgrades and savings on select products. This rugged, protective case is designed to help protect the 11" diagonal notebook from most accidental damage that can occur in mobile environments like schools, businesses, and other institutions. The case is designed with features that enable the user to work directly from the case with full accessibility to ports and viewing angles while protecting the notebook. 3 ft drop test open and closed. Robust zippers designed for rugged use. Rubber feet to help prevent case from sliding on slanted surfaces. Carry handle and padded shoulder straps. ID Card holder. Rubberized elastic straps for enforcing grip. Air ventilation interior ribs. Corner and edge absorption protection when open. USB, power cable accessibility when open and in use. Tough elastic screen holders keeping screen aligned with back wall. Get a one-year limited warranty. 3 ft drop test open and closed. Robust zippers designed for rugged use. Rubber feet to help prevent case from sliding on slanted surfaces. Carry handle and padded shoulder straps. 1 Test results are not a guarantee of future performance under these test conditions. Accidental damage requires an optional HP Accidental Damage Protection Care Pack.